I believe in blog’s totallity - design, content, way of blogging, niche, etc. These are essential part of captivating readers and making them experience your brand. 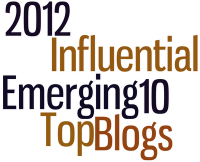 Emerging Influential Blogs writing project seeks to identify new and emerging blogs for 2012. In this writing project, Bloggers are required to cite/nominate 10 blogs from anywhere in the world (only started from June 2011) which we find to have its impact on you. Blogs should at least be 3 months old to join the writing project. (For more details, check this link.) These blogs are gradually gaining a considerable amount of readership, following, influence, and fascinating the reader in various ways. They also blog for various reasons such as expression of thoughts, sharing of knowledge and insights, events reporting or coverage, and some for profit. It's again the time of the year when bloggers have to choose 10 blogs which have been making an impact to it’s readers and have become influencers on their own way. The search for the Top 10 Emerging Influential Blogs is now on it’s 6th year, this is initiated by Janette Toral of Digital Filipino. What kind of design catches your eye? How do you like to interact with the blogger? http://www.lifestylehub.net/ - I enjoy reading this blog for I am able to relate to each other. As far as design goes.... simple.... if it takes forever to load a blog because of all the extra stuff I just wont read it. I want content in the post not the blog set up. http://mommysmaglife.blogspot.com/ - I love this blog for it has a clean layout with a personal touch. It's nice to be able to see the blogger's personality right off the bat. I'm always with this blogger and I love how she writes her articles. http://www.yummytales.com/ - It's so obvious that I love to eat! I mostly enjoy recipe, diy/crafty, and review posts - anything helpful, really! http://myrandombucket.tumblr.com/ - I love this blog from which I can feel the author's personality. No, I don't mean that they are crying their heart out in every single post, but some bloggers just manage to write posts their personality shines through. http://mightymaustrap.blogspot.com/ - I like blogs that aren't overly niche-y just like this one. Niche's are great and all, but when a blogger isn't at least a little bit versatile and there's no diversity in the posts, I sort of feel like I'm just reading the same post over and over again. http://www.lovemindanao.blogspot.com/ - I like blogs that are informative and very well written like this one. Well thought-of words always draw me in. This makes me more curious and wants to visit Mindanao soon. http://www.eccentricyethappy.info/ - I prefer blogs with a variety of posts (fashion, lifestyle, recipes, entertainment...) over those focusing on only one niche. However, there are some great blogs that focus only on their one thing and are pretty awesome, so this is just a matter of opinion. http://the-urban-walker.blogspot.com/ - This one's also a general blog. What I like more on this blog is the simplicity of the lay-out and easy navigation. http://thetalkingsenses.blogspot.com/ - I love blogs with opinions and stand regarding what's happening with our count;ry today. I find this blog unique with a personality that is a little different from the majority in a certain niche. Unique, not trying too much to follow certain rules. http://marcelosantosiii.com/ - I just met a the Blogger behind this yesterday and I praised him that I do like reading his posts where people talk about their dreams, their plans, how they acomplish it or generally ideas for living a better life. I often find these very inspiring. This writing project is made possible through the support of the following sponsors: DigitalFilipino Club, Search Profile Index, Tof Salcedo, Philippine Data Center, Philippine Online Shopping, Manila Standard Today and DigitalFilipino.com. If you have a blog that started anytime from June 1, 2011 to the present or at least 3 months old. So join this annual writing project by Digital Filipino! Hi Richard. Kindly edit your blog post and add a link to the writing project page. Let me know when done. Thank you! Hi Richard. I just marked your entry as complete. See you at the Summit!